It's so good, it's like a snow globe made of murder hobos and horrific violence. It's an abstract tactical puzzle, where if you are smart, tactics will beat numbers and arms. After a short tutorial battle, you are set loose upon a randomly generated world and can do what you want. Ally with a noble house, rob caravans, explore the unknown. Your troops gain levels, and you improve them selectively. 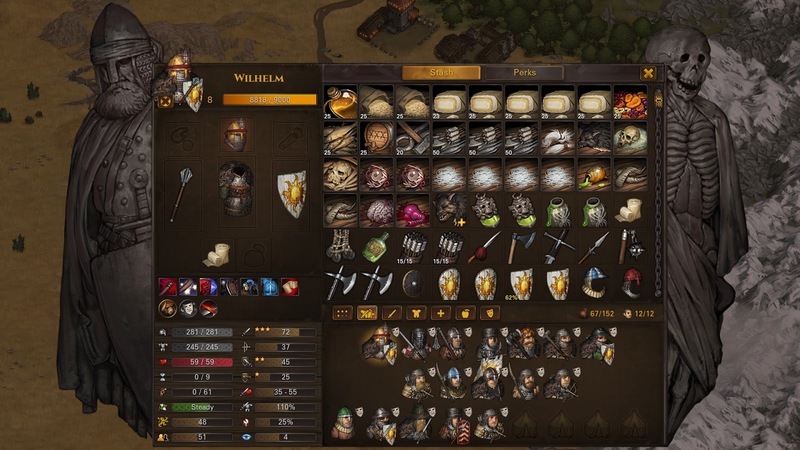 After the first hours of play you start to realize you can build them for specific roles—dagger assassin stabbing men to death in their heavy armor, nimble duelists moving first and darting between targets taking out back rank archers, bowmen raining down arrows, arbalisters knocking people off hills, heavy tanks taunting and drawing attention. From the palette of abilities they give you, you can make countless roles. 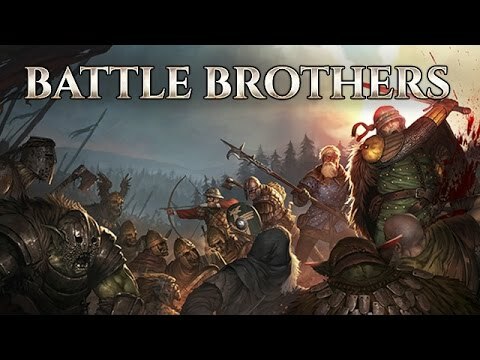 Let's talk about Battle Brothers! You manage a mercenary company. You must have gold and food for daily wages. 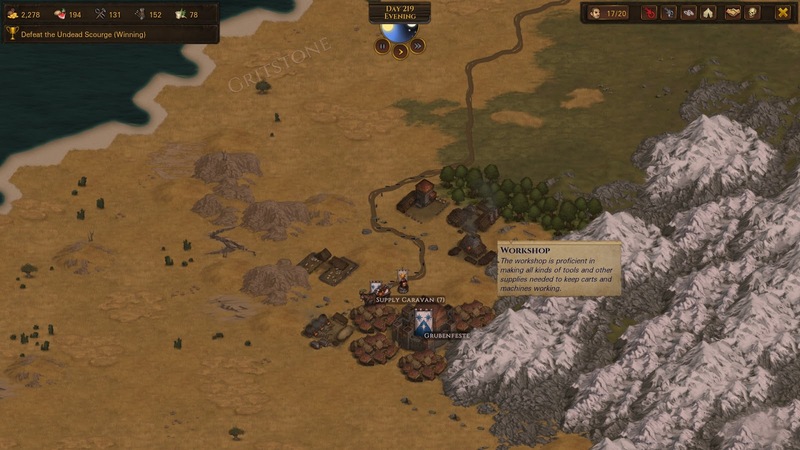 You can visit different cities, recruit and train new men, slay brigands, orcs, the dead in the wilds, and horrors even worse. Combat is turn based on a hex map with height levels, obstacles and terrain. The graphics are of your men and monsters as game pieces—they are busts that display all necessary information visibility, the condition of your helmet, armor, weapon, and man. You must manage your funds, via victories and trade, to bring in enough income to cover medical supplies, ammunition, tools to repair armor and weapons, food and wages. Over time your brothers grow increasing both 3 of their 8 stats and picking a new 'perk' which changes certain aspects of how they interact on the field. One might allow you to step away from an engagement, another might increase damage after you get a kill, a third by increase one of your stats by a %. Each different brother develops like a plant, where you guide their organic growth. Death comes quickly, along with permanent injuries, failure, and loss. But each choice, from where you move your piece on the battlefield, to what rolls you select when your brother levels, has ramifications that change the course of your game. I don't know the devs. No one is paying me. But when you find yourself staring into the facets of a diamond for untold hours (301 hours as of this post. Well, I guess it's told now. ), you kind of want to share. Why is it so engaging? is generated, cities have attached sites that determine their character, the spawns and arrangement of towns is always different, along with the distribution of lairs and dens of evil. The way the game works changes dramatically from these differing starting states. There are really strong parallels to sandboxes in Dungeons & Dragons here. I was very far into the game before I realized that each of those buildings adjacent to the city, changed not only the characteristics of that city, but how it interacts with the rest of the map. Those goat farms mean affordable goat cheese for your men. These building and even cities can be destroyed and rebuilt over the course of the campaign. Because this town has both an ore smelter and blast furnace, it produces high quality armor and weapons in the stores. But the regiments it produces are also extremely well armored and it has vision to the sea, meaning that it's hard for lairs to fester. Which, they do you know. Nits make lice. A goblin city will produce goblin patrols. As it grows, it will eventually send out a patrol that sets up a camp. Go in and clear out all the greenskins and it will take them a long time to repopulate. So each map is strongly different based on its random starting arrangement. Sometimes there's a forest town in the frontier assaulted constantly by enemies. Get dogs and birds from cities with kennels, and use them to hunt down nightmares and archers. It's often unclear how things affect other things, and I'm still discovering new nuances. Each nobel house has a personality, and I'm not certain, but it seems to affect which quests you get from it. Is this true? Only a lot more testing and play will tell. But everytime I reroll I find or see something new. Your first games end in brutal destruction, without even understanding why. But as you play you begin to understand, these aren't individual men, they are part of a squad that works together. Each man has a head and body. Those who don't wear a cover are corpses, yeah? Each is covered in armor. Better armor is not always 'better', some men go heavy armor and some go light, depending on their role. You take wounds in combat (which always heal, depending on severity in 1-6 days) based on the % of your hit points taken, meaning tougher brothers take fewer wounds. If killed, there's even a chance they survive with a permanent wound. And while some are. . .untenable, some people consider a boost (it's harder for witches to charm or giests to scare a brain damaged brother). Each man has eight statistics, and they increase by a random roll at every level. So you want to increase what he needs when the roll is high, and skip low rolls, but it's important to know what role they have so you can assign the stats correctly. The statistics are Hit points, Fatigue, Resolve, Initative, Melee Attack, Ranged Attack, Melee Defense, and Ranged Defense. When you hire a brother they may have traits, like iron lungs, or athletic, which positively or negative affect their stats. The following brother is Huge (+10% damage -5 Ranged Defense, -5 Melee Defense) and Paranoid (-40% initiative, +5 Ranged Defense, +5 Melee Defense) meaning he does +10% damage in exchange for going later in the round. So I gave him a cleaver, and made it reduce the damage he needs to do to wound, and gave him duelist so that more damage penetrates armor. So he cripples and bleeds anyone he strikes. This causes morale checks, which reduce the combat ability of your opponents. If you're reading this, you probably like the same things I like, and this sounds awesome, right? It is. You can name and go to the barber to change the look of your brothers. It's like controlling a team of bonsai trees that you have very carefully cultivated to mercilessly slaughter any who stand against you! The difficulty curve is very clear, with several different stages. When you start out, you aren't prepared for this. You generally end up destroying equipment you must salvage from your opponents. Striking someone in the head will leave their fancy armor untouched, or you can surround or dagger opponents to death. Every 100 in game days, a crisis occurs, either greenskins invade, the undead, rise, or there is a war among the noble houses. There are certain thresholds where the base difficulty increases. You have a range of danger options on the contracts you can take, as well as creatures in the wild getting more dangerous as you venture away from civilization. The recent expansion turned it from a good game into a great one. There are a selection of new enemies, creating different and dangerous tactical challenges both apart and with other groups. The enemy variety is very high and differs significantly between campaigns. It's like a good movie. Every part of the journey is fun. It's written by two brothers, not a big game studio. The soundtrack is amazing. There's a growing community of people who stream and play this game, that has significant overlap with interests in Dungeons and Dragons sandbox play. The actual game design is rock solid. It's amazing how neatly the different parts of the game interact with each other. You only have 9 action points a turn, but depending on the weapon, traits, and skills, you can turn that into two or three attacks each round. Once you see how the pieces fit together, you spend a lot of time thinking about how to turn that to your advantage, often only coming to the correct conclusion after a lot of testing or tries. It's good and I needed to tell people about it. Don't complain to me about missed sleep. 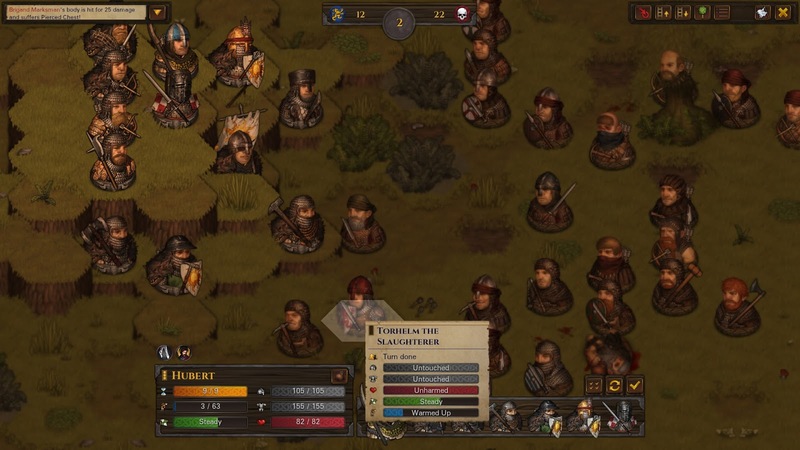 Battle Brothers is $30 on Steam. Sounds literally too good to buy. Thanks for the tip.